I love mak guksu or bibim guksu. It's simple but if done right, the taste is heaven. I had my first bibim guksu and mak guksu in HomePlus near Jakjeon, Incheon and I fell in love right on the spot. As you know, I love spicy food and it is one of the reason why I could accept Korean food. When I have a sudden pang for bibim guksu, I kept thinking of the one in HomePlus but one day I was in school and through Naver I found Yurim Myeon!! Yurim Myeon had a 50 years traditional recipe under its belt and I was curious. So I headed there with Julia and we savoured Bibim guksu and Nembi guksu. Both were marvellous but on winter days, we would prefer warm Nembi guksu. Nembi guksu reminded me of Kitsune Udon..hmm I guess they are the same. The only difference is Yurim Myeon throws in some rice cake..hehe to Koreanize it somehow. 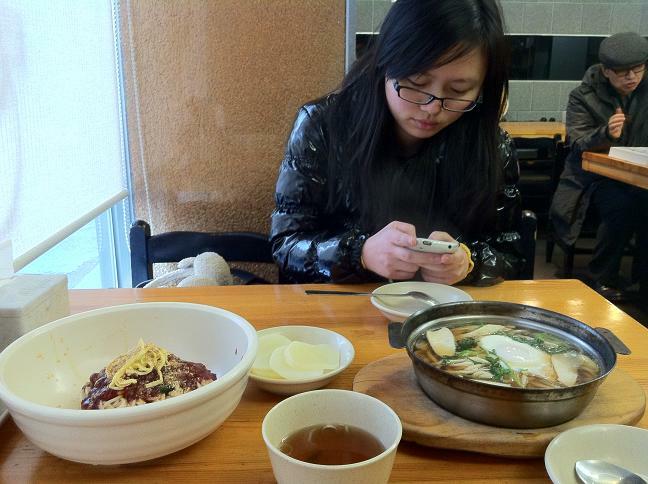 Julia vouched for Bibim guksu as she had never tasted non-meat guksu as delicious as this. Myself, I love the strong perilla seeds concoction (you know my infatuation with perilla leaves right?) and promised to myself that I would return for more someday. 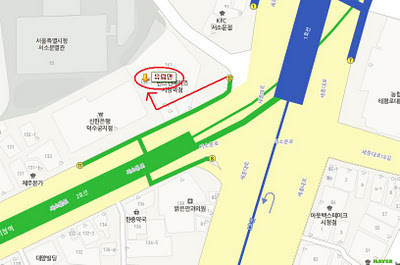 If you are around Deoksugung (Deoksu Palace) or City Hall area, try this meal. But don't come around lunch time, it will be a long bee line. After 2pm would be better. I had mine at about 3pm. What's the difference between Mak guksu / Bibim guksu/ Bibim memil? Bibim mean rub or mix. It's the same as Bibimbap. Guksu means noodle from wheat. Mak/Memil means noodle from buckwheat. Similar to soba noodle. For Bibim Guksu recipe try MyKoreanKitchen and if you can read Korean, check out Mak Guksu recipe here. How to go to Yurim Myeon? turn right on the first alley. More pictures in BudgetTravel2Korea Facebook.